Sorry for the informality but I wasn’t sure whom to address this to otherwise. Jeff Bezos? Maybe but he seems like he’s got a lot going on. John Mackey? Is he even still around? Have you checked a bulk bin? Anyway, I wanted to talk to you about one of your ads. It’s from last year so it’s not exactly recent but given everything, I still think it’s worth talking about because it reveals a core misunderstanding of your vegan consumer market. Also, I’m in a pissy mood. It seems like the point of one of your ads is that veganism is just another diet among others and that your shoppers are shape-shifters who move from vegan to paleo to whatever just because the whim strikes them, like Tarzan swinging from whatever vine is most conveniently within grasp. What your marketing team doesn’t seem to realize is that veganism is actually a deeply-held moral position, not a dietary fad to pick up and drop like a seasonal fashion trend. In other words, veganism isn’t the platform foam sandal of the 1990s, as much as I miss those. Or to put it in more Whole Foods-y terms, shuffling in a vegan card to one’s deck of diets is not like someone switching back and forth between whether they prefer Gingerberry or Pink Lady Apple kombucha flavors. Veganism actually means something pretty significant. Shouldn’t you know this? The ad in question says so much in a scant 15 seconds. Here’s the scene: Two men are standing at a Whole Foods meat counter. The one who reminds me of every art major dude (plus 15 years) I knew in college says to the guy behind the counter, “Hey, man, could I get a pound of the flank, a pound of the ground sirloin and a ribeye.” His friend, looking a little taken aback despite having walked to the meat counter together a second before, says, “Hey, I thought you were vegan.” Hipster dude says, “Yeah, I’m paleo now.” “Oh,” his friend utters, blinking a few times, absorbing it. “I’m flexible,” the ordering guy says with a weirdly intense stare that contradicts his stated flexibility. Here, 11 seconds in, the Whatever Makes You Whole tagline and the WFM logo pop in. Somehow, eating carcasses is now what makes this dude whole. Actor-I-am-filled-with-unreasonable-contempt-toward then returns to addressing the WFM meat counter guy and says, “Oh, and give me just some of that, too, [inaudible]…” making some indistinct swirly gesture with his finger toward more animal remains in the case, not even seeming to care what it is he’s ordering because he’s flexi-paleo now, and, hey, man, whatever. It’s all good, baby. Yes, this is a real Inside the Actors Studio character study, I know. “Vegan” isn’t a flashy label, nor is it a diet. High-carb? That describes a diet. Pescatarian? Same. Sugar-free? Yes, diet. Paleo, as much as followers want to claim that it’s a lifestyle, is just a diet, too, unless “paleo values” extend to a practice and philosophy that encompasses much more than one’s stance on carbs and protein and macros and cavemen and whatever else paleos argue about on social media. It’s not hard to see how WFM’s marketing team jumbled veganism in with the other diets and it’s also not surprising that they would have a vested interest in wanting consumers to think of eating animals as just another benign but feel-good choice among other choices. Like the famous Coke commercial, Whole Foods shoppers can celebrate their differences in shared, perfect harmony on a hilltop meadow because they really don’t have differences: vegan one week, paleo the next, and nothing means anything because it’s all about “choice”. All that matters is you smile wholesomely to the camera and keep shopping at Whole Foods because it’s a drag to be the vegan in a chorus when breast of organic snow-white turtle doves are on sale at the meat counter. Does this mean that I’m judging people for not being vegan? 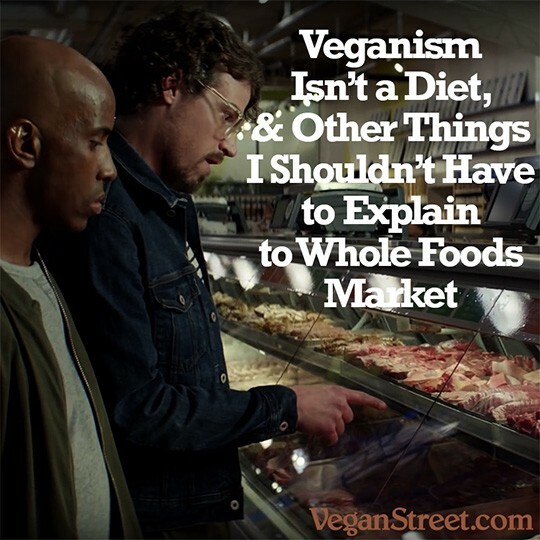 No, I’m judging you, Whole Foods Market, for having two actors to play bros who walk up to a meat counter and utter words of sheer nonsense that convey veganism — a philosophy and practice of harm reduction, compassionate living and commitment to justice — as just another diet that you can try on and shrug off and leave in a heap on the dressing room floor. Don’t get me wrong: some people do treat it exactly like that (*cough*thirsty-YouTubers*cough*) but that’s a shallow interpretation of their own and not reflective of what veganism is about. So this is all to say that you need to stop trying to make veganism out to be just another dietary fad that comes and goes. It’s insulting, it’s dishonest and, frankly, it makes you come off as clueless and greedy. Do you really need that kind of PR, Whole Foods? Please visit my website for vegan recipes, tips, interviews, reviews, a nifty guide for new vegans and much more. Or don’t. See if I care.